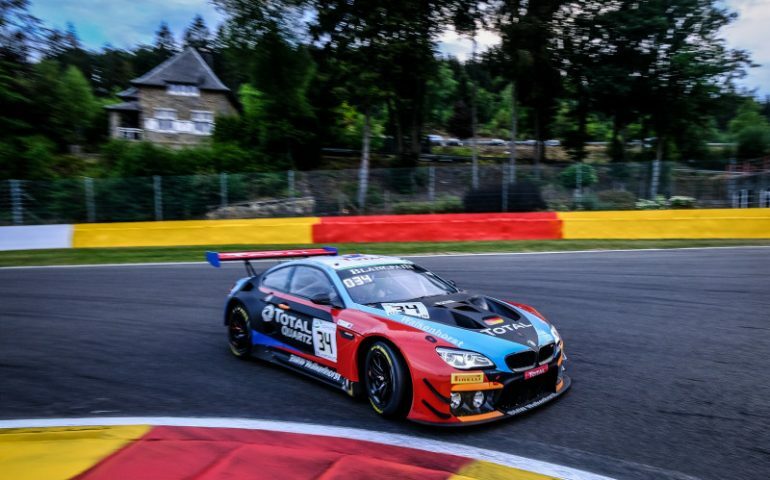 BMW has scored provisional pole in qualifying for the Spa 24 Hours, the second round of the Intercontinental GT Challenge. Bathurst 12 Hour regulars Walkenhorst Racing topped the charts, the average time of 2m19.115 set by drivers Tom Blomqvist, Philipp Eng and Christian Krognes enough to comfortably secure them the number one seed. Spa 24 Qualifying set the grid from 21st backwards, with the top 20 cars subsequently progressing to a Shootout to decide the pointy-end of the grid tomorrow. The BMW trio ended up three-tenths faster than a host of Audi R8 GT3 entries, the 12-hour winning brand locking out second, third, fourth and fifth positions. Markus Winkelhock, Chris Haase and Fred Vervisch were second, while 12-hour winners WRT were third. Robin Frijns, who was part of the 12-hour winning squad, continues in that car. Frijns’ 12-hour winning teammate Dries Vanthoor was fourth in the sister WRT Audi, driving with Christopher Mies and Alex Riberas. Vincent Abril, Andy Soucek, Maxime Soulet put the No. 8 Bentley Continental GT3 sixth, while Black Falcon put their Mercedes-AMG seventh. The first of the Porsche brigade was the Team75 Bernhard 911GT3 entry in eighth with Earl Bamber, Timo Bernhard and Laurens Vanthoor sharing the driving duties. With the SMP Racing Ferrari and Grasser Racing Lamborghini next, seven different brands are represented in the pre-qualifying top-10, with the R-Motorsport Aston Martin eleventh throwing another brand into the mix. The top 13 cars were covered by one second. Click here for the full qualifying results. Live streaming of the Spa 24 Hour will be available via the event website here.